VW Audi Skoda asiento soporte Socket bombilla carcasa genuino 893945265B. AUDI A100 1994. Audi A6 1995-1996. AUDI A8 1994-1999. AUDI A8 1999-2003. AUDI A8Q 1994-1999. AUDI A8Q 1999-2003. Audi cabriolet 1992-2000. Passend für alle Fahrzeuge mit D1S Fassung. Aus hochqualitativen Quarzglas. 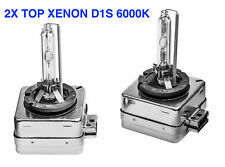 2 x D1S 35W Xenon Brenner 6000 Kelvin. Sockel: PK32d-2 / D1S. Model: NIGHT BREAKER UNLIMITED XENARC. Fits Model: FABIA Hatchback (6Y3). Fits Make: SKODA. Bulb Type: D2S. Part Manufacturer: Osram. Operates: LOW BEAM. Number of Bulbs Supplied: 2. Fits Year: 10/99-12/07. Manufacturer Part Number SJHK8326. H7 Canbus HID Kit de 10000k 35W azul. Potencia: 35W (igual fábrica equipada faros de xenón). CanBus: Sí (evitará errores de salpicadero en el 99% de los vehículos). Montaje: H7. Manufacturer Part Number SJHK4476. H7 Profesional Canbus HID Kit 3000k 55W amarillo. Color: 3000k amarillo dorado. CanBus: Sí (unidad de calidad profesional incluye X-3 Canbus para evitar errores de consola). Manufacturer Part Number SJHK1642. H3 Profesional Canbus HID Kit 3000k 35W amarilla. Color: 3000k amarillo dorado. Potencia: 35W (igual fábrica equipada faros de xenón). Montaje: h3. CanBus: Sí (unidad de calidad profesional incluye X-3 Canbus para evitar errores de consola). Fits Model: FABIA Estate (6Y5). Fits Make: SKODA. They will upgrade the standard bulb. You should always replace the bulbs on both sides of the vehicle. You can fit these bulbs yourself, the job requires no specialist tools or knowledge, just patience! Product Type: Footwell Light. They will upgrade the standard bulb. You should always replace the bulbs on both sides of the vehicle. You can fit these bulbs yourself, the job requires no specialist tools or knowledge, just patience! Manufacturer Part Number SJHK3005. Color: 3000k amarillo dorado. H3 HID Kit profesional 3000 k amarillo 55W. Montaje: h3. Reference OE/OEM Number H3 453. Headlight Bulb Type H3. Potencia: 55W (extrema alta potencia). Fits Model: ROOMSTER (5J). They will upgrade the standard bulb. You should always replace the bulbs on both sides of the vehicle. You can fit these bulbs yourself, the job requires no specialist tools or knowledge, just patience! Fits Model: ROOMSTER (5J). Fits Make: SKODA. They will upgrade the standard bulb. You should always replace the bulbs on both sides of the vehicle. You can fit these bulbs yourself, the job requires no specialist tools or knowledge, just patience! Fits Model: OCTAVIA Estate (1Z5). Fits Make: SKODA. They will upgrade the standard bulb. You should always replace the bulbs on both sides of the vehicle. You can fit these bulbs yourself, the job requires no specialist tools or knowledge, just patience! 1x Halogenscheinwerfer links. 1x Halogenscheinwerfer rechts. Halogenscheinwerfer links. Passend für SKODA OCTAVIA (1U2) Bj. Fahrzeugausstattung für Fahrzeuge ohne Xenon-Licht. Halogenscheinwerfer rechts. 1x Halogenscheinwerfer links. 1x Halogenscheinwerfer rechts. Halogenscheinwerfer links. Halogenscheinwerfer rechts. Fahrzeugausstattung für Fahrzeuge mit Leuchtweiteregelung (elektrisch). Anwendungsbereich Fernlicht, Nebelscheinwerfer vorne, Abblendlicht. 1x Halogenscheinwerfer rechts (Beifahrerseite). Halogenscheinwerfer rechts. Leuchtefunktion mit Positionslicht. Passend für Skoda Fabia II 2 Typ 5j / Roomster Bj 10->> Facelift. Leuchten-Bauart Halogen. Hauptscheinwerfer Links 2741522. Einbauposition: Links. Links-/Rechtslenker: für Linkslenker. Lichter & Leuchten. Auspuffanlagen & Teile. Auftrag komplett. Antriebsteile & Getriebe. Alkar gilt als zuverlässiger Partner für qualitative und passgenaue Rückspiegel. Para Skoda Roomster 2006-2015 lado/Lo/Hi manga 501 H7 H7 Xenon bombillas. Estaremos encantados de encontrar las piezas correctas para usted. 2 x 501, 4xH7 = 6. Esta venta es para estrenarbombillas de los faros de xenón. Manufacturer Part Number SJHK2490. H4 Profesional Canbus HID Kit 8000k 35W azul. Color: 8000k azul. Potencia: 35W (igual fábrica equipada faros de xenón). CanBus: Sí (unidad de calidad profesional incluye X-3 Canbus para evitar errores de consola). Manufacturer Part Number CPHK2526. H7 Profesional Canbus HID Kit 8000k 35W azulActualización LED Montaje: H7. Color: 8000k azul. Potencia: 35W (igual fábrica equipada faros de xenón). CANBUS: Sí (unidad de calidad profesional incluye X-3 Canbus para evitar errores de consola). Hauptscheinwerfer Links 2751522. Einbauposition: Links. Links-/Rechtslenker: für Linkslenker. Lichter & Leuchten. Auspuffanlagen & Teile. Auftrag komplett. Antriebsteile & Getriebe. Alkar gilt als zuverlässiger Partner für qualitative und passgenaue Rückspiegel. Para Skoda Fabia 1999 - 2007 lado/Low/High Beam 501 H7 H3 Xenon bombillas. Estaremos encantados de encontrar las piezas correctas para usted. 2 x 501, 2xH7, 2xH3 = 6. Fitting type 501 (W5W), H7 (477), H3 (453). Viga (completa) alta: H3. Luz lateral: 501. En Caja : 2 x 501, 2xH7, 2xH3. Las bombillas de xenón producen salida de luz más blanca que las bombillas estándar. Consulte el manual del vehículo para confirmar la idoneidad de estas bombillas para su vehículo. Para Skoda Octavia de 1996 - 2004 lado/cruce/principal/niebla faros Xenon bombillas Kit. Esta venta es para estrenarbombillas de los faros de xenón. Model Octavia. Make Skoda. Estaremos encantados de encontrar las piezas correctas para usted. Komplett neue Heckleuchte. Lichter & Leuchten. Einbauposition: Rechts. Antriebsteile & Getriebe. Auspuffanlagen & Teile. Motoren & Motorenteile. SKODA 1Z5 945 111A, SKODA 1Z5 945 112A. Zusatzinfo: ohne Lampenträger. Fits Model: OCTAVIA (1U2). Fits Make: SKODA. They will upgrade the standard bulb. You should always replace the bulbs on both sides of the vehicle. You can fit these bulbs yourself, the job requires no specialist tools or knowledge, just patience! D1S montaje - 4 300 k de fábrica original. HID Xenon KitsHID Xenon Kits. HID Bulb Holders. OEM BALLASTS. Reverse Parking Sensors. - 2007-2008 Mini Cooper. - 2005-2008 CHRYSLER 300 C. - 2005-2009 Chevy Corvette. Bremsleuchte Bremslicht Octavia Combi (1Z5) 1Z9945097C. LED Bremsleuchte Bremslicht. Scheibenwischer Gummi für Bosch Aerotwin Wischergummis 70 cm zuschneidbar! Wischergummis Scheibenwischergummi für Scheibenwischer Bosch Aerotwin 750mm. Manufacturer Part Number SJHK6830. H1 Kit HID 10000k 35W azul. Potencia: 35W (igual fábrica equipada faros de xenón). Montaje: H1. Reference OE/OEM Number H1 448. Headlight Bulb Type H1. Para Skoda Octavia de 1996-2004 bajo la luz larga Xenon H4 H4 bombillas Set lámpara. Estaremos encantados de encontrar las piezas correctas para usted. Fitting type H4 (472). Model Octavia. Make Skoda. Heckleuchte Links. Antriebsteile & Getriebe. Lichter & Leuchten. Zusatzinfo: ohne Lampenträger. Auftrag komplett. Seit über 30 Jahren ist JOHNS ein kompetenter Partner für Außenspiegel, Beleuchtung und Karosserieteile. This is a Skoda Superb 2008-13 Single Bulb Kit for the following cars Supberb 2008 - 2013. This is a new, genuine part. Part number. Alternative part number(s). Para Skoda Yeti 2009-2016 baja alta niebla Xenon faros bombillas H4 H4 H7 conjunto. Estaremos encantados de encontrar las piezas correctas para usted. Model Yeti. Esta venta es para estrenarbombillas de los faros de xenón. Skoda Octavia de 1996-2004 baja alta niebla Xenon faros bombillas H4 H4 H3 establecer. Estaremos encantados de encontrar las piezas correctas para usted. Fitting type H4 (472), H3 (453). Esta venta es para estrenarbombillas de los faros de xenón. 2 x quemador de Xenon D1S 6000 K. -Versión D1S. Descripción:Conjunto de quemador de xenón (2 piezas). Produktgruppe Lampen. EAN 4260416052284. Marke SLPRO. Diseño de aldea Dogo®. (Por adelantado). Manufacturer Part Number SJHK1055. Color: 8000k azul. H1 Azul de profesionales HID Kit 8000 k 35W. Potencia: 35W (igual fábrica equipada faros de xenón). Montaje: H1. Reference OE/OEM Number H1 448. ESTE ES UN KIT DE HID PRO MONTADO CON COMPONENTES DE CALIDAD PROFESIONAL. Manufacturer Part Number SJHK5790. H4 Kit HID 3000k amarillo 35W. Color: 3000k amarillo dorado. Potencia: 35W (igual fábrica equipada faros de xenón). Montaje: h4. Reference OE/OEM Number H4 472. Headlight Bulb Type H4.